Screen shot from the video for Elton John's “Nikita” (1985). Themes of love, loss and the other trials of our personal lives have been the mainstay of popular music for centuries. But in every generation there are pop artists who have taken on that other great theme called politics, responding to current events and instances of injustice both domestic and global, and bringing often controversial issues to the attention of the young people who make up their audience. Growing up in Macedonia in the 1980s, my awareness of global politics was very much influenced by pop music, as a number of A-list artists during that era released huge hits addressing political issues, some of which were considered quite controversial at the time. One of the most influential and overtly political songs by the Irish rockers, “Sunday Bloody Sunday” describes the horror the Bloody Sunday massacre in Derry, Northern Ireland, in which British troops shot and killed 14 unarmed civil rights protesters and bystanders in 1972. The sound of the voice of the young Bono, shouting “This is not a rebel song, this is Sunday Bloody Sunday!” can still cause one to feel goosebumps, even for those who for whom he has become very much a part of the establishment. The following year, U2 released “Pride (In the Name of Love)”, about the American Civil Rights movement and the assassination of Martin Luther King Jr.
Guyanese British musician Eddy Grant turned the age-old pop song device of addressing a loved one on its head in 1988’s “Gimme Hope Jo'anna”. The Jo'anna in question is not a woman, but a nickname for the South African apartheid regime, personified by the city of Johannesburg. German band Nena gained worldwide fame with their 1983 hit “99 Luftballons”. The original German version of the song tells the story of a trigger-happy fighter pilot provoking a military incident after shooting at a swarm of children's balloons, starting a 99-year war. At the peak of his career in 1985, Elton John sang about “Nikita”, a love interest confined behind the Iron Curtain. The name “Nikita” is given to both boys and girls in Slavic countries. 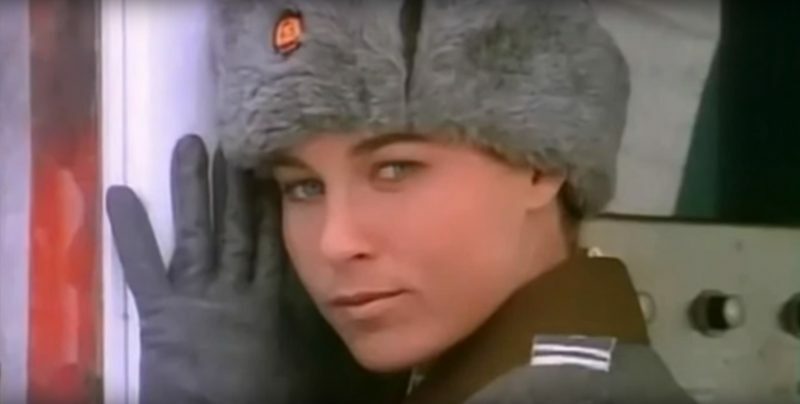 The video for the song featured the beautiful Nikita character, played by British female athlete and model Anya Major, famous for starring in Apple Computer's “1984” commercial. Another song promoting empathy and humanizing “the enemy” was Sting's “Russians” (1985), which commented on the exchange of warmongering rhetoric and fears of nuclear annihilation. In 2010 Sting said that his inspiration for the song were Soviet children's programs like these that he had watched via a “stolen” satelite TV signal. The collapse of the Soviet system also inspired several songs. “Wind of Change” by the German rock band Scorpions, released in 1990, became an anthem for the reforms that were underway, with high hopes, all over Central and Eastern Europe. This list is just a tiny sampling of a vast tradition that includes hits such as Simple Minds’ “Belfast Child” and “Mandela Day,” (1989), and the somewhat more recent “Zombie” by the Cranberries, released in 1995. What is your favorite political pop song? Leave us a note in the Comments! When talking about politics and pop songs, the first one that comes to my mind is “GIMME THE POWER”, by the Mexican band Molotov. A song that is perfectly fit for most LatAm coutries, both then and in the present day.